Pink Mongolian Sedum is a great edging or rock garden plant. The leaves are a blur-green color with pink flowers appearing in late summer and lasting through early fall. The flowers will attract butterflies and bees. It will grow to a height of 4" to 6" tall and 6" to 12" wide. Plant Pink Mongolian Sedum in full sun to partial sun in well drained soil. 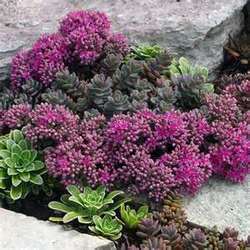 Plant Pink Mongolian Sedum in a Rock Garden, alpine trough, Miniature Garden, or a container. Pink Mongolian Sedum is deer resistant and drought tolerant once it is established. Pink Mongolian Sedum is also a Firewise Plant.